Name: Govina II Acrylic Modern Bathtub 71" - NEW DESIGN! This impressive, large acrylic modern bathtub comes fully equipped with an over flow, pop-up and drain. 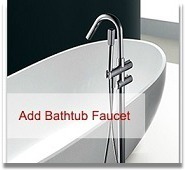 The smooth, tapered edges will bring your eye up to the inviting interior of this exquisite bathtub. The use of curves along side modern clean lines is the great example of excellently planned out bathtub design. This modern acrylic bathtub not only evokes a sense of beauty and style but also functionality. The Govina II will become a fabulous focal point for any bathroom. Allow this beautiful freestanding bathtub to surround you and support you as you take rest and relaxation to a whole new level.